On Monday, May 12, FNC's Fox and Friends exposed Democratic hypocrisy in accusing Republicans of trying to raise money off the deaths of Americans from the Benghazi attack, when Democrats themselves have a history of linking fundraising to deadly events. Shameless shilling for the Demcratic Party's presumptive presidential 2016 nominee appears to have reached an all-time peak. ABC, CBS, and NBC ballyhooed former Defense Secretary Robert Gates's attacks on President Obama and other high government officials on their Tuesday evening and Wednesday morning newscasts. NBC's Brian Williams and CBS's Norah O'Donnell also trumpeted the former Cabinet official's "devastating critique" of the President in his upcoming memoir. All three networks also played up Gates's self-identification as a Republican. Assisting the Obama administration in its perpetual flight from responsibility for anything, former Obama campaign manager David Axelrod, who now campaigns from a paid propaganda perch at NBC and MSNBC, tweeted the following on Friday afternoon (HT Twitchy): "Wonder how many Insurance cos that sold junk policies after ACA was signed told customers at purchase that they'd have to eventually switch?" The Washington Post's Bob Woodward made a spectacularly delicious comment to MSNBC's David Axelrod on NBC's Meet the Press Sunday. Former Barack Obama campaign manager and current MSNBC senior political analyst David Axelrod today immaturely taunted those who disagree with him on Obamacare by tweeting the following question: "Isn't it ironic that the most ardent opponents of the Affordable Care Act are now complaining that people can't sign up fast enough?" Amidst all the blather about Republicans going over the cliff and taking the world with them, a tantalizing bit of truth broke through on today's Morning Joe. Doomsaying notwithstanding, the GOP is actually positioned to do OK in 2014. Making the comment particularly surprising was its source: none other than Barack Obama's former senior adviser himself—David Axelrod. View the video after the jump. One thing is certain: Axelrod didn't do the rest of us any favors . . .
On today's Morning Joe, after Joe Scarborough empathized at length, in the context of the Syrian situation, about what a lonely job President Obama has, David Axelrod actually had the chutzpah to say "there have been many days where I wonder, gee, I wonder if all of us who helped him get elected did him a favor." View the video after the jump. Pretty much all you need to know about the current negligent media culture in Washington is summed up in two items involving the Politico's home page this morning -- one which is there, and one which isn't. 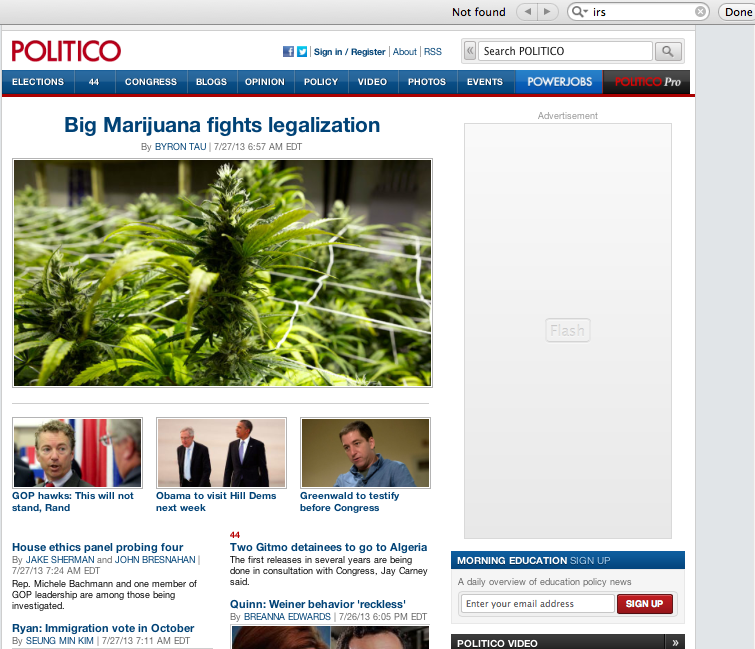 The featured story at top of the home page by Byron Tau is about infighting between "Big Marijuana" -- it seems like "Big Pot" would be a more succinct nickname -- and those who want to extend recent electoral victories in legalizing the drug. What isn't there on the home page, as confirmed in a word search, is any story with a headline or tease containing "IRS." Former Barack Obama senior advisor David Axelrod on Tuesday demonstrated why it's absurd for him to have been hired by NBC News at the beginning of his previous boss's second term. Then Eric Holder’s Justice Department was revealed to be wiretapping the Associated Press in April and May of 2012 to nail a leaker. President Obama is not a “victim” of a “second-term curse.” This is the corrupt first term beginning to smell, it is his administration, and even the media cannot deny the odor of malfeasance.